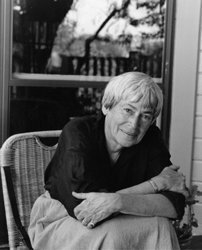 The National Book Award–winning third novel in the renowned Earthsea series from Ursula K. LeGuin gets a beautiful new repackage. The tree nearest the fountain, a well-grown rowan, had humped and cracked the marble pavement with its roots. Veins of bright green moss filled the cracks, spreading up from the grassy plot around the basin. A boy sat there on the low hump of marble and moss, his gaze following the fall of the fountain’s central jet. He was nearly a man, but still a boy; slender, dressed richly. His face might have been cast in golden bronze, it was so finely molded and so still. “Tell it, then,” the Archmage said gravely, but like one yielding to a child’s impatience; and while Arren spoke, he looked again at the crystal curtain of water drops falling from the upper basin into the lower, not as if he did not listen, but as if he listened to more than the boy’s words. “You know, my lord, that the prince my father is a wizardly man, being of the lineage of Morred, and having spent a year here on Roke in his youth. Some power he has and knowledge, though he seldom uses his arts, being concerned with the ruling and ordering of his realm, the governance of cities and matters of trade. The fleets of our island go out westward, even into the West Reach, trading for sapphires and ox hides and tin, and early this winter a sea captain returned to our city Berila with a tale that came to my father’s ears, so that he had the man sent for and heard him tell it.” The boy spoke quickly, with assurance. He had been trained by civil, courtly people, and did not have the self-consciousness of the young. “The sea captain said that on the isle of Narveduen, which is some five hundred miles west of us by the ship lanes, there was no more magic. Spells had no power there, he said, and the words of wizardry were forgotten. My father asked him if it was that all the sorcerers and witches had left that isle, and he answered, ‘No: there were some there who had been sorcerers, but they cast no more spells, not even so much as a charm for kettle-mending or the finding of a lost needle.’ And my father asked, ‘Were not the folk of Narveduen dismayed?’ And the sea captain said again, ‘No, they seemed uncaring.’ And indeed, he said, there was sickness among them, and their autumn harvest had been poor, and still they seemed careless. He said—I was there, when he spoke to the prince—he said, ‘They were like sick men, like a man who has been told he must die within the year, and tells himself it is not true, and he will live forever. They go about,’ he said, ‘without looking at the world.’ When other traders returned, they repeated the tale that Narveduen had become a poor land and had lost the arts of wizardry. But all this was mere tales of the Reach, which are always strange, and only my father gave it much thought. “Then in the New Year, in the Festival of the Lambs that we hold in Enlad, when the shepherds’ wives come into the city bringing the firstlings of the flocks, my father named the wizard Root to say the spells of increase over the lambs. But Root came back to our hall distressed and laid his staff down and said, ‘My lord, I cannot say the spells.’ My father questioned him, but he could say only, ‘I have forgotten the words and the patterning.’ So my father went to the marketplace and said the spells himself, and the festival was completed. But I saw him come home to the palace that evening, and he looked grim and weary, and he said to me, ‘I said the words, but I do not know if they had meaning.’ And indeed there’s trouble among the flocks this spring, the ewes dying in birth, and many lambs born dead, and some are . . . deformed.” The boy’s easy, eager voice dropped; he winced as he said the word and swallowed. “I saw some of them,” he said. There was a pause. Arren’s trip from the north, down past the great isle Havnor and through the Inmost Sea to Roke, was his first voyage. Only in these last few weeks had he seen lands that were not his own homeland, become aware of distance and diversity, and recognized that there was a great world beyond the pleasant hills of Enlad, and many people in it. He was not yet used to thinking widely, and so it was a while before he understood. “Where else?” he asked then, a little dismayed. For he had hoped to bring a prompt cure home to Enlad. Once more the Archmage looked at him, and this time, for all his training, Arren looked away. He did not know why, for there was nothing unkind in the gaze of those dark eyes. They were impartial, calm, compassionate. All in Enlad looked up to his father, and he was his father’s son. No man had ever looked at him thus, not as Arren, Prince of Enlad, son of the Ruling Prince, but as Arren alone. He did not like to think that he feared the Archmage’s gaze, but he could not meet it. It seemed to enlarge the world yet again around him, and now not only Enlad sank to insignificance, but he himself, so that in the eyes of the Archmage he was only a small figure, very small, in a vast scene of sea-girt lands over which hung darkness. “Your duty is to your father, not to me,” the Archmage said. His eyes were still on Arren, and now the boy looked up. 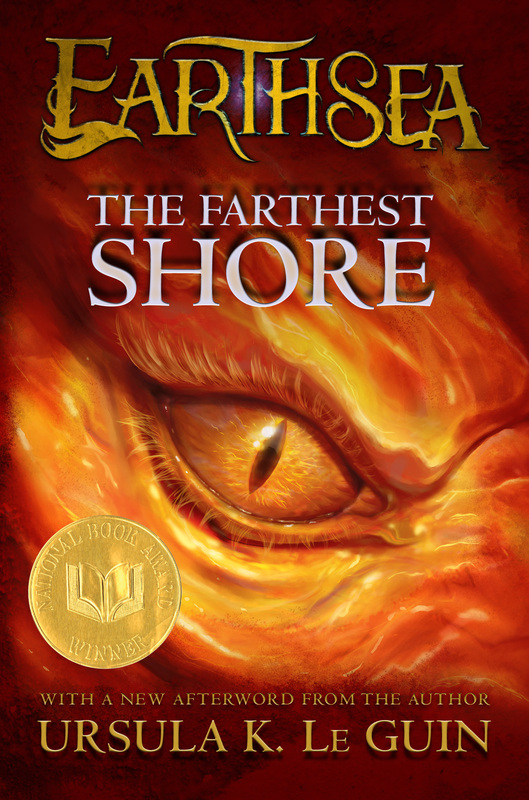 As he had made his act of submission he had forgotten himself, and now he saw the Archmage: the greatest wizard of all Earthsea, the man who had capped the Black Well of Fundaur and won the Ring of Erreth-Akbe from the Tombs of Atuan and built the deep-founded sea wall of Nepp; the sailor who knew the seas from Astowell to Selidor; the only living Dragonlord. There he knelt beside a fountain, a short man and not young, a quiet-voiced man, with eyes as deep as evening. His self-assurance was gone, his face was flushed, his voice shook. At his hip he wore a sword in a sheath of new leather figured with inlay of red and gold; but the sword itself was plain, with a worn cross-hilt of silvered bronze. This he drew forth, all in haste, and offered the hilt to the Archmage, as a liegeman to his prince. He stood up and came with silent, vigorous step to Arren, and taking the boy’s hand made him rise. “I thank you for your offer of service, and though I do not accept it now, yet I may, when we have taken counsel on these matters. The offer of a generous spirit is not one to refuse lightly. Nor is the sword of the son of Morred to be lightly turned aside! . . . Now go. The lad who brought you here will see that you eat and bathe and rest. Go on,” and he pushed Arren lightly between the shoulder blades, a familiarity no one had ever taken before, and which the young prince would have resented from anyone else; but he felt the Archmage’s touch as a thrill of glory. For Arren had fallen in love. He had been an active boy, delighting in games, taking pride and pleasure in the skills of body and mind, apt at his duties of ceremony and governing, which were neither light nor simple. Yet he had never given himself entirely to anything. All had come easily to him, and he had done all easily; it had all been a game, and he had played at loving. But now the depths of him were wakened, not by a game or dream, but by honor, danger, wisdom, by a scarred face and a quiet voice and a dark hand holding, careless of its power, the staff of yew that bore near the grip, in silver set in the black wood, the Lost Rune of the Kings. Forgetting courtly farewells he hurried to the doorway, awkward, radiant, obedient. And Ged the Archmage watched him go. A little man of no age appeared. Young he was not, so that one had to call him old, but the word did not suit him. His face was dry and colored like ivory, and he had a pleasant smile that made long curves in his cheeks. “What’s the matter, Ged?” said he. For they were alone, and he was one of the seven persons in the world who knew the Archmage’s name. The others were the Master Namer of Roke; and Ogion the Silent, the wizard of Re Albi, who long ago on the mountain of Gont had given Ged that name; and the White Lady of Gont, Tenar of the Ring; and a village wizard in Iffish called Vetch; and in Iffish again, a house-carpenter’s wife, mother of three girls, ignorant of all sorcery but wise in other things, who was called Yarrow; and finally, on the other side of Earthsea, in the farthest west, two dragons: Orm Embar and Kalessin. “Aye,” said the Doorkeeper, smiling, and was gone; and the Archmage also was gone; and the fountain talked to itself all serene and never ceasing in the sunlight of early spring. SOMEWHERE TO THE WEST OF the Great House of Roke, and often somewhat south of it, the Immanent Grove is usually to be seen. There is no place for it on maps, and there is no way to it except for those who know the way to it. But even novices and townsfolk and farmers can see it, always at a certain distance, a wood of high trees whose leaves have a hint of gold in their greenness even in the spring. And they consider—the novices, the townsfolk, the farmers—that the Grove moves about in a mystifying manner. But in this they are mistaken, for the Grove does not move. Its roots are the roots of being. It is all the rest that moves. Ged walked over the fields from the Great House. He took off his white cloak, for the sun was at noon. A farmer plowing a brown hillside raised his hand in salute, and Ged replied the same way. Small birds went up into the air and sang. The sparkweed was just coming into flower in the fallows and beside the roads. Far up, a hawk cut a wide arc on the sky. Ged glanced up, and raised his hand again. Down shot the bird in a rush of windy feathers, and stooped straight to the offered wrist, gripping with yellow claws. It was no sparrowhawk but a big Ender-falcon of Roke, a white-and-brown-barred fishing hawk. It looked sidelong at the Archmage with one round, bright-gold eye, then clashed its hooked beak and stared at him straight on with both round, bright-gold eyes. “Fearless,” the Archmage said to it in the tongue of the Making. The big hawk beat its wings and gripped with its talons, gazing at him. The farmer, away off on the hillside under the bright sky, had stopped to watch. Once last autumn he had watched the Archmage take a wild bird on his wrist, and then in the next moment had seen no man, but two hawks mounting on the wind. This time they parted as the farmer watched: the bird to the high air, the man walking on across the muddy fields. He came to the path that led to the Immanent Grove, a path that led always straight and direct no matter how time and the world bent awry about it, and following it came soon into the shadow of the trees. The trunks of some of these were vast. Seeing them one could believe at last that the Grove never moved: they were like immemorial towers grey with years; their roots were like the roots of mountains. Yet these, the most ancient, were some of them thin of leaf, with branches that had died. They were not immortal. Among the giants grew sapling trees, tall and vigorous with bright crowns of foliage, and seedlings, slight leafy wands no taller than a girl. The ground beneath the trees was soft, rich with the rotten leaves of all the years. Ferns and small woodland plants grew in it, but there was no kind of tree but the one, which had no name in the Hardic tongue of Earthsea. Under the branches the air smelled earthy and fresh, and had a taste in the mouth like live spring-water. In a glade which had been made years before by the falling of an enormous tree, Ged met the Master Patterner, who lived within the Grove and seldom or never came forth from it. His hair was butter-yellow; he was no Archipelagan. Since the restoral of the Ring of Erreth-Akbe, the barbarians of Kargad had ceased their forays and had struck some bargains of trade and peace with the Inner Lands. They were not friendly folk, and held aloof. But now and then a young warrior or merchant’s son came westward by himself, drawn by love of adventure or craving to learn wizardry. Such had been the Master Patterner ten years ago, a sword-begirt, red-plumed young savage from Karego-At, arriving at Gont on a rainy morning and telling the Doorkeeper in imperious and scanty Hardic, “I come to learn!” And now he stood in the green-gold light under the trees, a tall man and fair, with long fair hair and strange green eyes, the Master Patterner of Earthsea. It may be that he, too, knew Ged’s name, but if so he never spoke it. They greeted each other in silence. Between two tall grass blades in the clearing a spider had spun a web, a circle delicately suspended. The silver threads caught the sunlight. In the center the spinner waited, a grey-black thing no larger than the pupil of an eye. “She too is a patterner,” Ged said, studying the artful web. “What is evil?” asked the younger man. The round web, with its black center, seemed to watch them both. “A web we men weave,” Ged answered. In this wood no birds sang. It was silent in the noon light and hot. About them stood the trees and shadows. “South and southwest. North and northwest,” said the Patterner, never looking from the round web. “Aye,” said Ged. “We must look to the deep springs, I think. We have enjoyed the sunlight too long, basking in that peace which the healing of the Ring brought, accomplishing small things, fishing the shallows. Tonight we must question the depths.” And so he left the Patterner alone, gazing still at the spider in the sunny grass. At the edge of the Grove, where the leaves of the great trees reached out over ordinary ground, he sat with his back against a mighty root, his staff across his knees. He shut his eyes as if resting, and sent a sending of his spirit over the hills and fields of Roke, northward, to the sea-assaulted cape where the Isolate Tower stands. Then he listened, a big, thin old man, white-haired under his dark hood; and the students at their writing-tables in the tower room looked up at him and glanced at one another. But under his tree the Archmage Ged, who knew all the names of moly, withdrew his sending and, stretching out his legs more comfortably and keeping his eyes shut, presently fell asleep in the leaf-spotted sunlight.